Using timers to track your billable time is a simple and convenient way of capturing your hours. 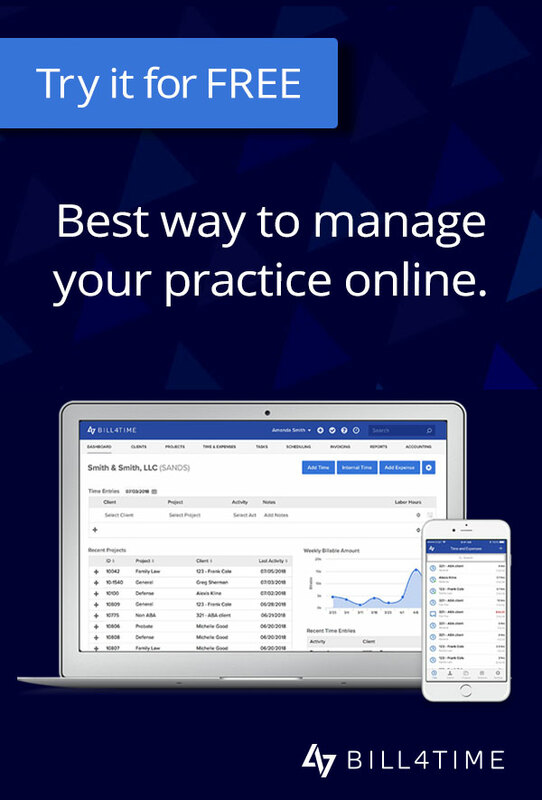 There are many ways to utilize timers in Bill4Time, for example, on a new billable entry and on your mobile or widget applications. What you may not know is that there are many benefits of using the Multi Timer feature in the program itself. At the top of any page you will notice a small clock icon. This allows you to create as many timers as you need. 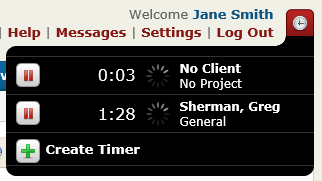 Once you click the Create Timer option it allows you to fill in a Client, Project and further details, but if you choose not to fill those in at that time, you can click to start a blank timer. The benefits of using the multi timer is that the entries are built into the server so if your browser closes, power goes out, computer shuts down, etc., these timers will never stop running until you pause or save them in the system. Another added bonus is that if you start a timer from one location, go to a different location and sign into the program, you still have access to these timers no matter where you go. Never miss another minute of billed time with the Bill4Time multi timer! Here’s a Pro tip on how to organize your Reporting! If you find yourself generating the same report using the same filters, you can save those filters to your Favorite reports. 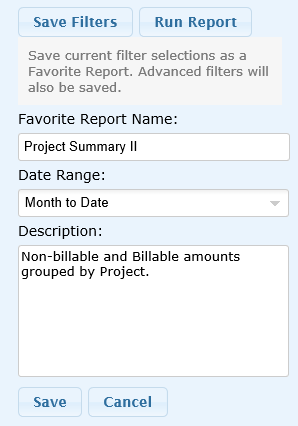 Once you have generated a report using your preferred filters, click the Save Filters button. Rename the report, select a Date Range, add a custom Description and click Save. After selecting Reports from the blue menu bar, you will be directed to the main Bookmarked screen. If you click on the Favorites tab, you will see the reports that you saved with the specific filters you chose. If you click the star next to this report, you can bookmark it so that it shows up on the first page when accessing your Reports Dashboard. 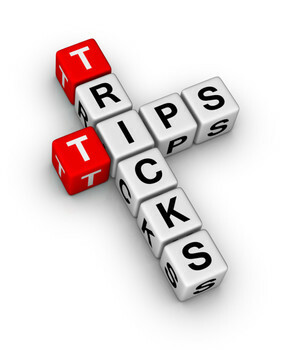 Bookmark your most used reports to always have them at your fingertips when you need them! Learn more about Bill4Time features on our Support page.